I have a slightly complicated relationship with running. I know all about the health benefits of incorporating running into your daily life, and I've been told by more than one health professional that it's one of the best ways to maintain weight and/or knock off a few extra calories that you may have drank over the weekend (hello, wedding dress...). But I don't like running - it's hot, it's repetitive, and it's a solitary activity. But I also like running - primarily because it's hot, it's repetitive, and it's a solitary activity. The post-run "feel good" is pretty potent, and there are few other exercises that work my entire body as quickly and efficiently and with as little equipment as just going for a run. But still - how many days do I put "RUN" on my to-do list and crawl into bed hours later without having crossed it off? Last summer, I wrote about starting to run and how I, without really thinking it through, signed up for my first 5k. But once that Mindfulness Triathlon ended, so did my running career. I hung up my gym shoes and never really hit the road after that. Sometime last March, though, I got the "I have pent up energy and need to exercise" bug and dusted off the old sneaks. I headed out with visions of conquering every river and bridge in the tri-state area, only to immediately realize that it was 35 degrees out and the streets were covered in snow. One mini meltdown, the acceptance of an early birthday present, and a frantic local gym tryout later, I was a proud member of the Astoria branch of New York Sports Club - a mid-range gym with decent stretching areas and plenty of treadmills. It wasn't too long before I had a system for my time at the gym. 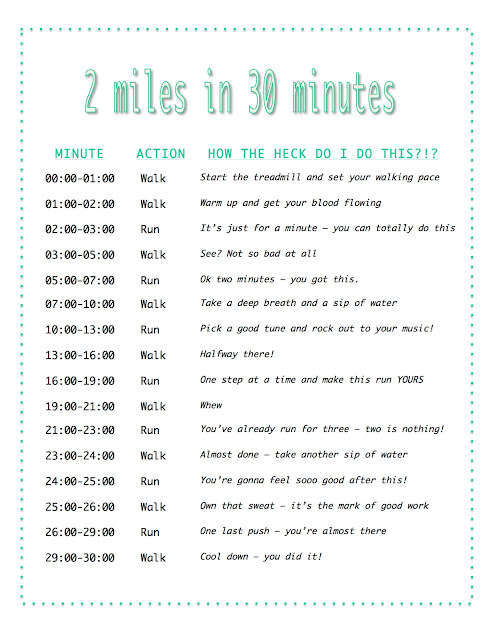 I work really well with structure and parameters, and I developed my own plan for a 30-minute, 2-mile run/walk. By alternating between running and walking and never doing either for more than three minutes at a time, I never get bored with the walking or overwhelmed by the running. And while every person (and every treadmill) is different, I walk at 3.7 mph and run at 4.7 mph - which results in two full miles and around 6,500 steps (helping me reach that daily FitBit goal). 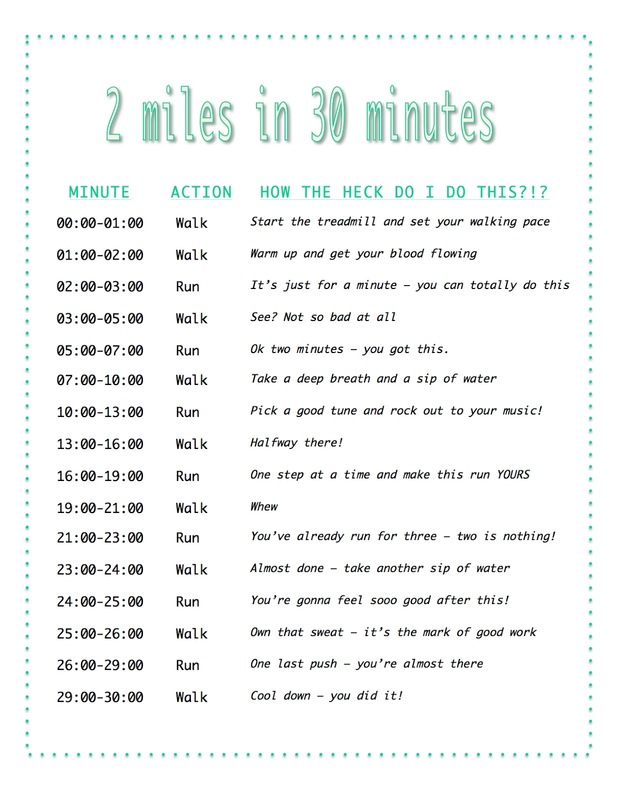 Please note - I am not a physician, personal trainer, or athletic authority in any way - this is a workout that works for me, and I share it with you to use as an approach to your running regimen. Consult your doctor before starting or altering your workout plan, and never do anything that results in pain or extreme discomfort. You know your body, and you know what it can handle. That being said, logging two miles on a treadmill might be absolutely nothing for some people - but it might also be a reach goal for others. Use this plan as a guide and an inspiration for starting a new workout or changing up a stale routine. I keep the music loud and the water bottle full, and I take care to spend at least 15 minutes stretching post-run. While I certainly don't make it to the gym as much as I should, I've been using this method for a couple of months now and I'm not even close to tiring of it. I know exactly how long I'm going to run, and there aren't any surprises. I feel great afterwards, and it's often just the energy-boosting run I need when in one of my blah moods. Try it out for yourself, and let me know what you think!